During my career, I’ve learned a few things about the challenges of working in performance driven environments and I’d like to share some of my thoughts on this. These perspectives are gleaned both from observation and personal experience – a career of helping high-performance individuals and teams stay top of their game necessarily ­­­­­involves sustained performance on my part too. This article is based on an interview I gave for British Airways Business LifeMagazine [http://businesslife.ba.com/News-and-Blogs/Business-Life-Blog/Matching-mental-and-physical-performace.html] on this topic. If nothing else, a high-performance career demands time, energy and focus within the rigid structure of organisational life. The body and brain require sleep, exercise, efficient breathing and a vibrant diet in order to perform optimally. While we all know this, it can be extremely challenging to maintain this recipe for success amidst competing commitments, travel demands and often-unrealistic expectations of others. Yet, not meeting these requirements has well documented detriments to performance. Scientific studies show clearly that sleep deprivation has very significant impact on both physical and mental health and wellbeing. Less than the minimum of 6 hours will hit most people’s performance hard. There is abundant evidence to support a diet filled with fresh produce and reducing or eliminating sugar intake. Although dietary options for those on the go are improving, it remains a challenge to maintain supportive nutrition while travelling the globe as necessitated by a high performing career. But sustained high-performance require mental well-being too. We often project “super-hero” expectations onto our leaders and role models. This makes it extremely difficult for high-performers to be open and express vulnerability. Organisational leaders often experience loneliness, and the ‘truth’ within their company can be elusive, as sub-ordinates tend to tell them what they want to hear. 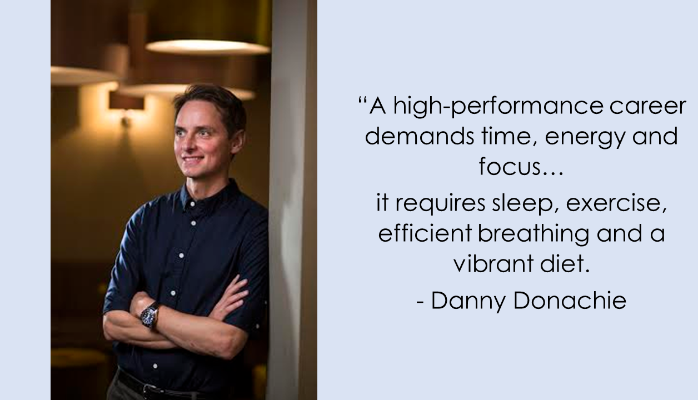 Combine this with hefty mental demands and the time and work-environmental pressures, preventing them accessing the physical requirements of sleep, diet and exercise, makes the maintenance of high-performance a very real challenge. While physical disabilities have become more acceptable in leadership roles, evidence shows that stigma certainly remains regarding mental health issues. High performing people are just as likely to suffer from mental health, depression and stress as anyone else. A high salary is often considered a pay-off for these mental challenges but it is vital that as leaders we remember our human nature and the requirements to nourish ourselves on all levels. These physical and mental aspects of performance are inseparable and taking care of these basic requirements is essential. Athletes and leaders rarely experience deep relaxation, yet I’ve witnessed many times how this can be simply transformative to performance. Ensuring that deep relaxation is part of a routine brings benefits that are immense. Meditation and mindfulness have been widely reported as being extremely helpful and in my experience yoga in particular is the most complete form of performance exercise. Are you a high performer? If you want to see the world in a different way and reach new heights, contact me to arrange an initial conversation. Read the testimonials on this site. They speak for themselves.